William was born on 21 February 1880 at Gaulter, Kimmeridge, Dorset, where his father Charles Seaward Cooper (1843-1927) was working as a carpenter. and Sarah Ann Cooper nee White who married at Corfe in 1866. Later William moved with the family to Kingston and, in 1898 he joined the Royal Navy at Portsmouth being allocated the service number P342021. William courted the girl across the road – Nora Sarah Hooper (1880-1948) who, following her schooling locally, became a successful housekeeper. Nora, born on 9 August 1880, was the eldest daughter of David Hooper (1843-1922) and Emily Sarah Hooper nee White (1845-1905 ). ⇒ Please see The Hooper / White Connection 1874 for more information. William and Nora married at Kingston Old Church in March 1907 while he was serving on HMS Majestic. Their first child David was born in 1907. At the time of the 1911 census, Nora was at West Street with her father David Hooper and her first two children. William was away serving in HMS Prince George. William was promoted to Petty Officer Blacksmith in May 1913 and served throughout World War 1 in HMS Agincourt. He was present at the Battle of Jutland which took place on May 31 1916. During his navy career the family lived in Portsmouth with Nora returning to her family home at Kingston when William was serving abroad and for the births of her children. A third son, Gerald Edward (1914) and a daughter Mary Geraldine De Courcy (1919) were both born at Kingston following the family tradition of the daughter returning to her parents home for the births, although Nora’s mother had passed away in 1905. After William left the RN as a pensioner in 1919, he and Nora lived in a cottage between West Lynch Farm and Blashenwell Farm between Corfe Castle and Kingston and William cycled 16 miles each day to work at Holton Heath, where he was employed dismantling surplus WW1 tanks. Around 1926 the family moved to a new council house at 1, West Street, Corfe Castle and William was later employed at the Norden Clay Works, just 2 miles north of Corfe Castle, again as a Blacksmith. Norden produced a very fine clay used in the manufacture of Minton china amongst others. Steam engines were used to transport the clay around and off of the site and maintenance of these was one of William’s tasks. William continued working there until his retirement in 1947. Sadly, his wife Nora passed away in 1948. In retirement William enjoyed gardening and kept a large vegetable plot from which he produced most if not all vegetables for the family kitchen. A pig or two were fattened in a sty at the end of the long garden. He remained in the same house throughout his life, eventually sharing it with his son Gerald and his family. Gerald eventually purchased the house from the council after it had been provided with modern sewerage disposal. If not in the garden, William was to be found “tinkering” in his workshop, usually on some metal based project and with his pipe aglow! The house was re-numbered to 58 West Street in the early 1960’s. Sadly in 1962 William was diagnosed with cancer of the throat and he passed away in Poole Hospital. He is buried together with Nora in the ‘old’ New Cemetery at Corfe Castle. David was born at Kingston in December 1907 while his father was serving on HMS Antrim. David married Kathleen Mary Florence Lester (1913-1987) at Hartley Wintney in 1936 and they had six children: Terence, Jacqueline, David, Kathryn, Roger and Malcolm. Unfortunately, the first two children died soon after birth, and Malcolm died in 1971. William died aged just 14 months of meningitis. From the 1911 census records a second son William George was born in May 1910 but sadly he died aged 14 months on 2 July 1911. This death is recorded in the Portsmouth Registry as William was then serving in HMS Prince George as a Blacksmith and Nora was living at 23 Wilson Road, Stamshaw, Portsmouth. The cause of death was Meningitis convulsions. Mary Geraldine Cooper aged 2. Photo courtesy of Ann Zweckbronner. Mary Geraldine Decourcy Cooper was born at Kingston on 17 October 1914 and baptised there. At the outbreak of World War 2, her occupation was shown as shop assistant. Mary married Alec Roy Cottrell (1914-1987) from Corfe on 28 October 1939. Mary and Roy’s wedding in 1939. Photo courtesy of Ann Zwechbronner. The photo above shows, left to right, Mary’s brother Gerald, Roy’s mother Millicent, the happy couple Roy and Mary and Mary’s parents, Nora and William. Mary and Roy had three children: William, Anne and Sarah. Mary died in March 2010 aged 95 years. Gerald married (Hilda) Margaret Hussey (1917-1980) from Chideock and their daughter Susan lives in Corfe. Note: The spelling of Seaward is as read from several documents but I believe it is derived from his mothers family name Seward. Charles was born at Kimmeridge suggesting that his parents had by then moved from Hide (sic) to Gaulter as Hide was in the Parish of Steeple. In 1861 aged 17, Charles was living with his parents and six siblings, at Gaulter near Kimmeridge. His father Thomas was a carpenter, and Charles took up this trade originally at Steeple and then at Kingston. In September 1866 Charles aged 22, married Sarah Ann White (1846-1933) aged 20 from Corfe Castle, in St. Edward’s Church at Corfe Castle. In the 1851 census, Sarah Ann was 5 years of age living with her grandparents George and Elizabeth White in East Street, Corfe Castle. Her mother is not identified. However the grandparents also have an unmarried daughter, Mary aged 34 staying with them and 3 grandsons all with the surname White. A younger daughter Caroline, who was Sarah’s mother and aged 30, is not present. In 1861 Sarah aged 16, is working as a domestic servant at the Castle Inn, Corfe Castle, owned or managed by a Mr Miller. The 1871 census identifies Charles and Sarah with three children and living in a cottage at Steeple. The eldest child, Elizabeth, is 4 years old, Eliza 2 and the baby Annie. In the 1881 census Charles and Sarah are still at Steeple with a family of six children at home: Eliza 12, Annie 10, Henry 7, Edward 2, Georgina 5 and William 1. By 1891 the family has moved to South Street, Kingston (part of the Encombe Estate) with six children at home and Charles is identified as a carpenter journeyman (self-employed) and is working on the Encombe Estate. The children at home were Edward 12, William 11, James 9, the twins Albert and Caroline 7 and Emma aged 5. In the 1901 census Charles is still working as a carpenter on the Encombe Estate, is still resident in (I believe no. 5) South Street, Kingston with his wife Sarah and they have living with them three children: James 19, Albert 17 and Emma 15 and two grandchildren James and Florence Cook aged 6 and 4 respectively and born at Rusper in Sussex (these were Eliza’s children). The census does not indicate the house number but I know that Caroline (known in the family as Auntie Carr) and her sister (Auntie) Annie (Dorey) lived in no. 5 as I visited them many times during my childhood and from family history they were still living where their parents had lived. Charles who was apparently a rather large person, predeceased his wife Sarah by some six years when he died in 1927. He was buried at Kingston New Church. Charles and Sarah had 12 children. From family history Sarah was a very meticulous character with regular habits and was particularly fussy about her hair which was brushed and combed each day, in her latter days by her daughter Caroline. In 1891 Elizabeth was employed as a cook by a Sarah White of East Street, Corfe Castle and in December 1900 she married James George Colman Clewes in Kingston Church. Bess and her husband moved to South Lambeth, London where he lived and where they raised two daughters known in the family as ‘Ciss’ and ‘Dolly’. Still at home aged 12 in the 1881 census but by 1891 she is employed as a cook to the Pinnery family at West Buckknowle, near Church Knowle. Eliza Alice married Walter Cook from Rusper, Sussex in 1894. They had two children: Seward James Cook and Florence Cook. Seward James, who married Clara Ethel Brain, was a member of London Regiment (London Rifle Brigade) and was killed in World War 1 on 16 June 1917. Seward’s son celebrated his 100th birthday on 15th January 2017! Walter Cookwho passed away some six years later. Eliza remarried at Kingston in 1909 to Thomas John Dipper also from Kingston. Annie was employed as a housekeeper and married (William) Frederick Dorey, a groom, also from Kingston, son of Stephen Dorey, a gardener. Sadly William died aged 41 leaving Annie to raise her two children Charles and Agnes. She continued working while her sister Caroline tended to the children. Aged 5 at the 1881 census. In the 1911 census Edward is working as a gardener and living with his wife Mary and three children Cecil, James and Violet at Winchfield, Hampshire. Nora married William Charles Cooper (1881-1962) at Kingston in 1907 ant they had four children: David, William, Mary & Gerald. Please see The Cooper / Hooper Connection 1907. Aged 19 at the 1891 census James is employed as a blacksmith at Kingston. James married Jane Tatchell (1883-?) and they had two sons Seaward Charles Cooper and George Frederick William Cooper. Please see The Cooper / Tatchell Connection#1 1908. Bert, as he was known was a twin with his sister Caroline and he married Frances Mary (Fanny) Tatchell from Kingston in September 1908. I believe it may have been Fanny who provided the part time ‘Sweet Shop’ in West Street. They had a daughter Winifred Gertrude. Please see The Cooper / Tatchell Connection#2 1908. Caroline married George Theodore Hunt and they lived with her father in Kingston. Caroline had no children of her own but she almost fostered her sister Annie’s children while Annie continued working as a Housekeeper. Caroline lived her latter years, still in her parents house No. 5, South Street, Kingston, with her elder sister Annie. As a child I recall visits to these elderly aunts – they were both scrupulous in their appearance and the house was spotless although there was always the lingering whiff of parafin which was used to fuel the cooking appliance. This small hob and oven produced fantastic fairy cakes, but we children had to remain silent unless spoken to! They were both frail and slim built and I can recall their grey hair but they were very loving Aunties and we loved visiting them. In her latter years Caroline was cared for by her neice Mary (Cottrell) at Verwood but she was laid to rest at Kingston. Emma married Edward James Leavey of Old Basing near Basingstoke. Richard St. George Bydder was a Master Mariner in the Mercantile Marine and died on 18 July 1920. He was the sister of Kingston school teacher Beatrice Allen nee Bydder. No information located as yet. George Davis was a Corporal with the Royal Garrison Artillery 11th Seige Battery (service number 137061) who died on 1 November 1917. George is commemorated at Dozinghem Military Cemetery in Belgium (grave/memorial reference X11. D. 8.). Henry James Furmage, known as ‘Harry’, was a Private with the Machine Gun Corps (Infantry), 100 Company (service number 14992) who died of wounds on 21 August 1916 in the Battle of the Somme. Harry is also commemorated on the war memorial at Corfe Castle. He was buried at Heilly Station Cemetery, Mericourt-L’Abbe, Somme, France (grave/memorial reference III. F. 23.). Harry was the second of two children born to clay miner James Furmage (1862-1956) and his wife Elizabeth Ellen Furmage nee Burgess (1859-1930). Harry was baptised at Corfe Castle on 7 July 1889. By 1901 his father had become a dairyman and the family were living at Afflington Dairy House near Kingston. By 1911 the family were at Scoles Dairy with Harry and his brother Thomas both Assistant Dairymen. Robert Grant was a Corporal with the Royal Garrison Artillery, 285th Siege Battery (service number 334335) who died on 25 March 1918 aged 23. Robert is commemorated at Faubourg D’Amiens Cemetery, Arras, Pas de Calais, France (grave/memorial reference VI. C. 25.). Robert was the son of Edward and Susan Grant, of Kingston, Corfe Castle, Dorset. David Hooper had served in the regular army with the Dorsetshire Regiment (service number 15705) and was discharged having completed both active and reserve service in 1910. He was called up in 1916 when the Military Service Act extended conscription to the ages of 18 – 40 years and then served as a Private with the Prince of Wales’s Leinster Regiment, 2nd Battalion (service number 5359). David was listed “Missing Presumed Dead” during the German offensive “Operation Michael” launched on 21 March 1918 in an attempt to regain areas of the Somme that they had lost earlier in the war. David died on 27 March 1918 aged 40. He is commemorated at Pozieres Cemetery, near Albert, Somme, France (memorial panel 78). David was the son of David Hooper and Emily Sarah Hooper nee White of West Street, Kingston, Corfe Castle, Dorset. James Medd was a Private with the Dorsetshire Regiment, 1st Battalion and also the Wiltshire Regiment, attd. 1st Battalion (service number 3/7850) who died 20 August 1916 in the Battle of the Somme. James is commemorated at Blighty Valley Cemetery, Authuile Wood, Somme, France (grave/memorial reference I. C. 3.). James was the son of Thomas Swan Medd (1846-1919) and Emily Ann Medd nee White (1843-1893). Albert George Speck was a Gunner with the Royal Garrison Artillery, 112th Siege Battery (service number 55793) who died on 21 March 1918 aged 20. Albert is commemorated at Beaumetz Cross Roads Cemetery, Beaumetz-les-Cambrai, Pas de Calais, France (grave/memorial reference B. 11.). Albert was the son of Walter and Mary Speck, of West Hill, Kingston, Dorset. Harry Stevens was a Private with the Dorsetshire Regiment, 2nd Battalion (service number 27367) who died on 16 July 1917 aged 34. Harry is commemorated at Baghdad (North Gate) War Cemetery, Iraq (grave/memorial reference XV. C. 11.). Harry was the son of the late John Stevens (1848-1915) and Mary Stevens nee Savage (1848-1898), of Eastington Farm, Swanage and husband of Alice ‘Daisy’ Maria Stevens nee Howard (1892-1976) of Blashenwell Farm, Kingston, Dorset. Harry and Daisy had a son Laurie Howard Stevens (1912-2005) and twins May Howard Stevens and Edward Howard Stevens both of whom sadly died shortly after birth in 1914. Frederick John Stickland was a Private with the Duke of Cornwall’s Light Infantry, 6th Battalion (service number 29199) who died on 23 August 1917 aged 19. Frederick is commemorated at Tyne Cot Cemetery, Zonnebeke, West-Vlaanderen, Belgium (grave/memorial reference LXVI. H. 29.). Frederick was the son of Alice Mary Stickland, of Encombe, Kingston, Corfe Castle, Dorset, and the late Edward Stickland. Henry Lawrance Travers was a Gunner with the Royal Garrison Artillery, 278th Siege Battery (service number 334312) who died on 30 May 1918 aged 26. Henry is commemorated at Pernois British Cemetery, Halloy-les-Pernois, Somme, France (grave/memorial reference I. E. 13.). Henry was the son of Henry ‘George’ Travers (1866-1951) and Bessie Maud Travers nee Speck (1870-1954) of South Street, Kingston, Corfe Castle. He left a widow Ellen Olive Travers nee Burden (1895-1968) of Tadnoll Cottage, near Dorchester and two children Thomas Henry William Travers (1915-2004) and Margaret ‘Joyce’ Travers (1917-2007). Ronald Henry Beavis was a Sergeant with the Royal Engineers. He died in September 1943 and was buried at Kingston. 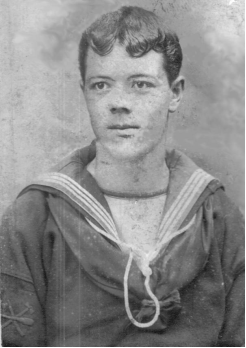 Able Seaman Henry Charles Kellaway (service number P/JX 249485) was serving with H.M.S. President III., Royal Navy. Henry died on 13 August 1942 aged 28. Henry was the son of Charles Henry and Lilian Kellaway, of Kingston, Dorset and the husband of Kathleen May Kellaway. Henry is remembered with honour on the Portsmouth Naval Memorial. Douglas John ‘Jack’ Hixson (1920-1949) is believed to have been invalided during World War 2. He died at The Borough Sanitorium, Weymouth on 14 November 1949 aged 29. Jack was buried at Kingston on 19 November 1949. Jack was the son of Albert ‘Ernest’ Hixson (1886-1962) and Elsie Hixson nee Collins (1885-1957). I am going to change the monthly collection (August 23rd) to a special object, viz., the National Society, which, in view of the Parliamentary invasion of the Church, we are asked to support. We shall know more about this Society on the Sunday mentioned, as we are to have a special preacher sent to us at one of the Services, morning or evening. A most gratifying result crowned our first entry in the Children’s Competition between the four counties of Dorset, Somerset, Devon and Cornwall. The competition consisted of an essay to be written by any member (between the ages of 9 and 14 years) of each Band, upon the subject of animals. The four best essays were first chosen out of the different Bands of Mercy, and then these were compared and judged together. The result of this judgment was a win for Plympton (in Devonshire) and second place for Kingston, with a certificate of recommendation. Kingston’s chosen four were: Margaret Grant, May Speck, Olive Audley and Ralph Hunt. Owing to a domestic bereavement, neither Mrs. Napier nor I were able to be present at the Concert on Friday, February 20th, in aid of the Band funds, so I can only speak of it from hearsay, instead of from personal experience. The day was unfortunately a wet one, but there were not many of the usual audience who were prevented from attending. The Concert appears to have been an unqualified success, and a sum of £2 18s. 6d. was handed over to Bandmaster W. Hooper. A very pleasing item in the Concert was the presentation to W. Hooper of a China dinner service by the choirmen and bandsmen on the occasion of his wedding, which took place on the following morning. Mr. W. Candy very kindly made the presentation in my absence. The March Collection will be for the Bishop of Salisbury’s Fund, and will be taken on Sunday, March 22nd. I have not as yet been able to come to any decision as to the manner of making a house-to-house visit for this purpose (as was proposed in the paper sent to you all by Colonel Rolson), and so, for this time, at all events, we must ask the authorities to be content with a Church offering. The amount (Morning Service only) received for and transmitted to the Church Army, February 22nd, was £1 10s.